Restaurants such this one would have been common in cities and towns during the 19th century. They provided working men with a cheap and nourishing meal during the day. 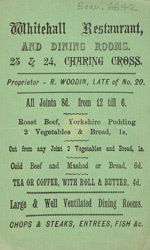 At this restaurant a cup of tea with a roll and butter cost just four pence. It was not thought acceptable for ladies to dine in public, so these were usually male-only establishments.